Learn from the best. 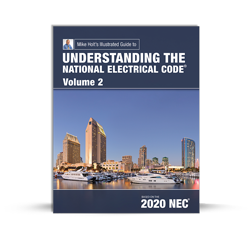 Mike Holt is nationally recognized as one of America's leading Code experts, committed to the safety of the electrical community. His training products are straightforward, easy to understand and effective, as reflected in the success rate of his students. Few articles can match Article 250 for misapplication, violation and misinterpretation. 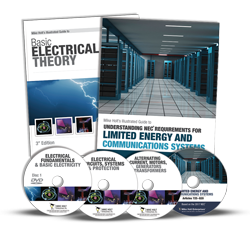 This program is unique in its ability to explain grounding, bonding and the difference between them, in such a clear and precise manner. The Author's Comments clarify and focus, and the graphics illustrate the applications of the rules. 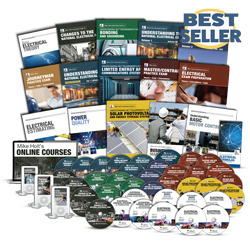 This program provides a great format for learning - with Mike's full-color textbook and dynamic DVDs. 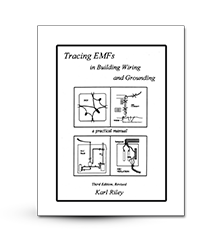 One of the most confusing areas of the trade continues to be Grounding and Bonding. 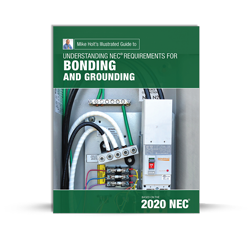 This textbook belongs in the hands of every Electrician, Inspector, and Engineer who needs to understand the seemingly conflicting information of how to properly apply the NEC rules of Grounding and Bonding. 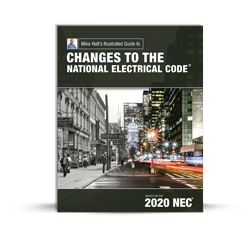 Mike's ability to explain these rules and the practical application of these rules in real world settings will help you really understand how to apply the NEC every day. 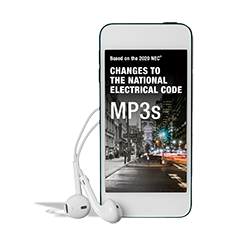 This MP3 audio download covers one of the most confusing areas of the electrical trade today: Article 250 of the NEC, Grounding and Bonding. 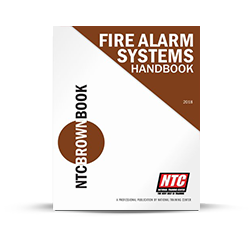 This package combines Mike's best-selling Illustrated guides into one great package. 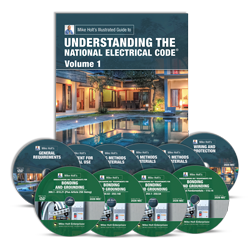 Mike's ability to clarify the meaning of the Code with his clear concise writing style, along with his highly praised full-color detailed instructional graphics is the reason that these books continue to grow in popularity around the industry. 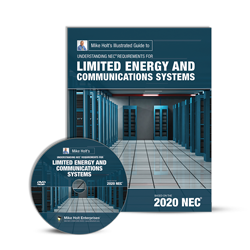 Find out why these books have become the standard for NEC training. 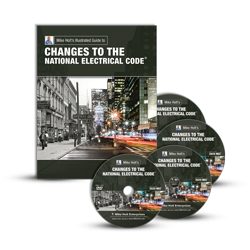 Mike's best-selling Illustrated Guide to the National Electrical Code bring the Code to life. 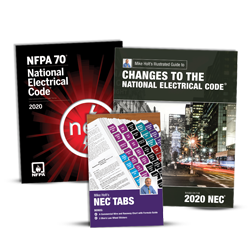 Save when you purchase them together with the NEC Exam Practice Questions textbook which provided over 2,000 practice questions on the NEC to test your knowledge. 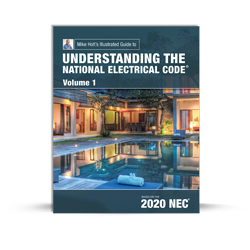 The purpose of this book is to create an ideal environment to test your NEC knowledge. The design of this book builds your skills section by section. 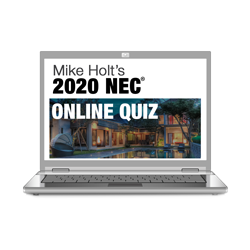 There are quizzes in Code Order and quizzes where the NEC questions are in random order in order to challenge your NEC knowledge. Final quizzes in random order help you really get familiar with your Code book. Going through this book really builds your Code knowledge and your ability to find things quickly as you proceed. NOTE: This book is extracted from the Exam Preparation textbook. 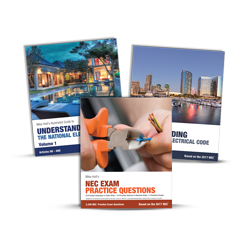 This is a great tool to help you prepare for an exam, make sure that you learn the NEC, or simply test your skills against one of the largest databases of NEC questions available on the market. It includes over 2,000 questions in random order, and you can add timing to your tests to help you prepare for a timed exam. 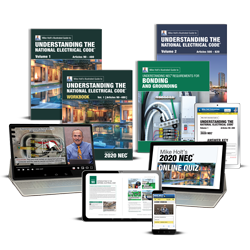 This workbook is designed to test your knowledge and comprehension of the material covered in the Understanding the NEC Volume 1 textbook. 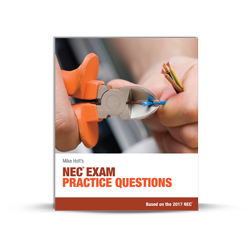 It contains more than a thousand NEC Practice questions in Code order as well as random-order final exams, and covers the general installation requirements contained in Articles 90 through 480. 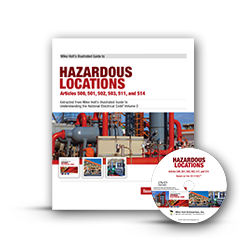 If your specialty is hazardous locations, this textbook and DVD is the perfect reference tool. 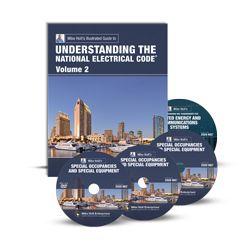 Extracted from Mike Holt’s Understanding the National Electrical Code, Volume 2, based on the 2014 NEC, it covers Hazardous Locations Articles 500, 501, 502, 503, 511 and 514. 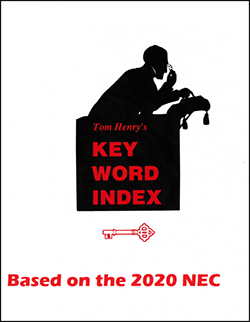 Also included is Article 90 Introduction to the NEC, and Article 100 Definitions. Enjoy your Code Changes course on the road! 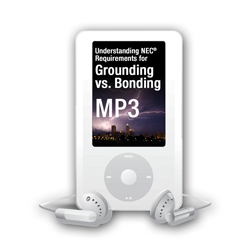 This audio download is copied directly from the Changes to the NEC DVD program, and can be played using a computer or any standard MP3 player. 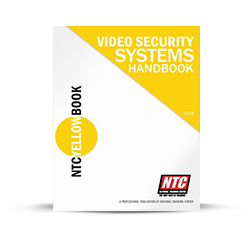 This special package includes the NEC Softbound Code Book, Mike Holt's NEC Tabs and Mike Holt's Illustrated Changes to the NEC textbook and DVDs. 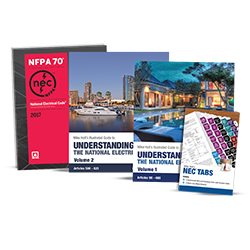 This special package includes the NEC Softbound Code Book, Mike Holt's NEC Tabs, and Mike Holt's Illustrated Changes to the NEC textbook. 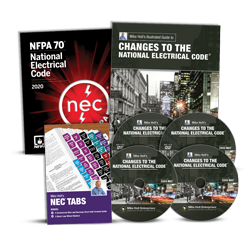 This special package includes the NEC Soft bound Code Book and Mike Holt's NEC Tabs. Mike's peel and stick tabs are a great way to customize your Code Book. 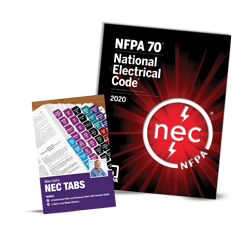 Placing tabs on Code articles, sections and tables will make it easier for you to use the NEC. 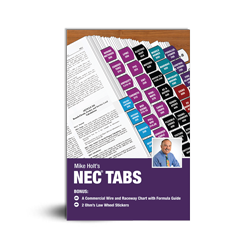 Mike's best-selling tabs make organizing your Code book easy. 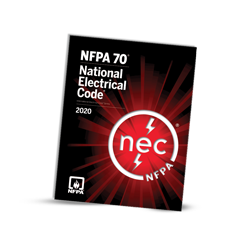 Softbound version of the NFPA Code Book. The spiral edition makes the Code Book much easier to use. The coil allows you to conveniently study by placing the book folden on your desk. It lays flat and you can even put it on a hook in your truck. 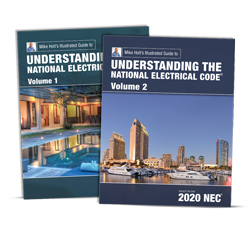 Brush up on your NEC knowledge as it relates to Limited Energy and Communications Systems,and expand your understanding of electrical theory in this great Limited Energy Library. 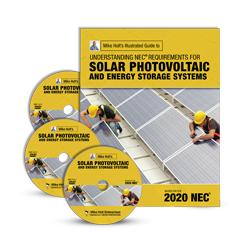 This full-color, illustrated textbook with corresponding DVD provides insight into many of the technical rules of the NEC that apply to limited energy systems. 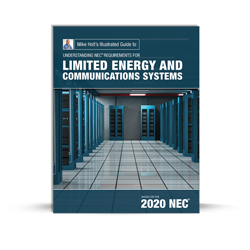 Subjects include the NEC rules that apply to low-voltage and limited-energy systems: definitions, the general NEC installation requirements, and specific NEC requirements for control, sound, video, CATV, CCTV, antennas, telephone, fiber optics, etc. 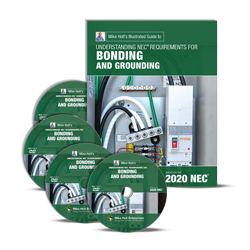 Topics include grounding, cable installation, spacing, support, etc. A trouble-shooting guide for electricians who are asked to find the sources of unusual AC magnetic fields in buildings. 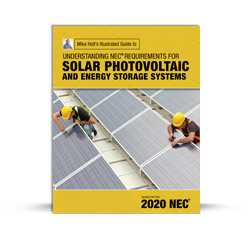 Since most of the sources are due to mis-connections which violate NEC, the steps for measuring, tracing and correcting the faults are spelled out in detail with many illustrations. 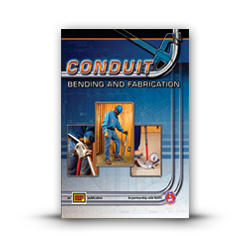 Grounding to water pipes is another source which can be modified; the book goes into grounding and its myths in depth. An electrician who absorbs the material in this book will feel comfortable dealing with customer concerns about magnetic fields in their buildings, and will know how to proceed to reduce or eliminate those fields. 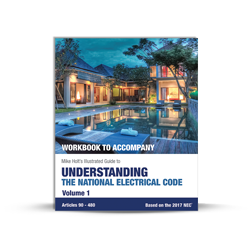 Ugly's Electrical References© is designed to be used as an on-the-job reference. 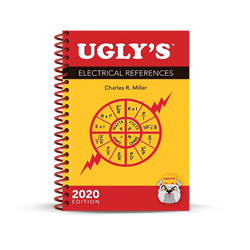 Used worldwide by electricians, engineers, contractors, designers, maintenance workers, instructors, and the military; Ugly's© contains the most commonly required electrical information in an easy-to-read and easy-to-access format. 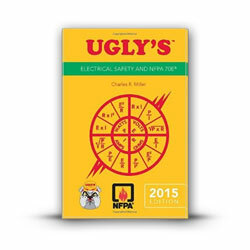 Ugly's© presents a succinct portrait of the most pertinent information all electricians need at their fingertips, including: mathematical formulas, National Electrical Code tables, wiring configurations, conduit bending, voltage drops, and life-saving first aid procedures. 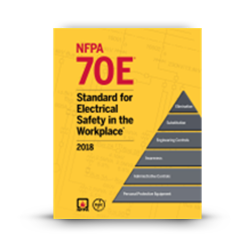 Ugly's Electrical Safety and NFPA 70E is designed to be used as a quick on-the-job reference covering the key requirements for electrical safety in an easy-to-read format, for field practitioners, electricians, maintenance personnel, contractors, inspectors, and engineers. 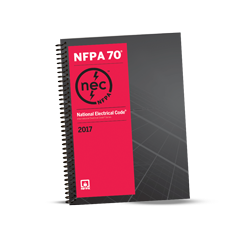 This Ugly's guide is based on NFPA 70E, Standard for Electrical Safety in the Workplace.